The fourth annual FreshTracks Road Pitch, a five day motorcycle tour of Vermont in which a gang of “business bikers” (comprised of investors, entrepreneurs and business advisors) ride around the state and stop in ten Vermont towns to listen to entrepreneurs pitch their business concepts, will be held July 31st through August 4th 2017. Entrepreneurs interested in pitching their concept or business to the riders should contact one of the local organizers noted below in order to apply for a pitch slot. 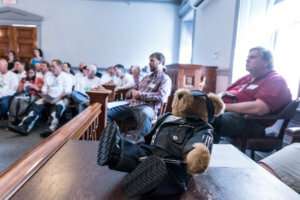 At each of the 10 stops the riders will award a “Riders Choice Prize” of $500 and a special edition “Vermont Biker Bear” contributed by Vermont Teddy Bear. Each stop is open to public viewing. For information about Road Pitch, this year’s event, the riders, and valuable pitching tips, visit www.roadpitch.co. Read the Road Pitch press release here: 2017 Road Pitch Schedule, Prize Package, Sponsors.